NOTE: I initially wrote this article in early 2016 but never published it until recently. However, upon looking at the results of the two anime streaming companies this month, I thought it would be an interesting “Back to the Future” case study. See current results here. 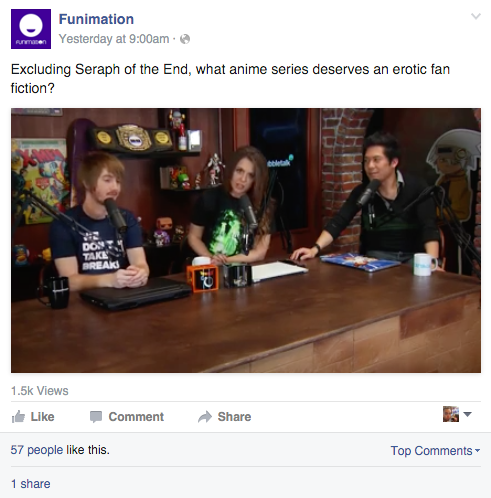 It’s only been recently where Funimation has begun branding themselves as the premier anime streaming source. 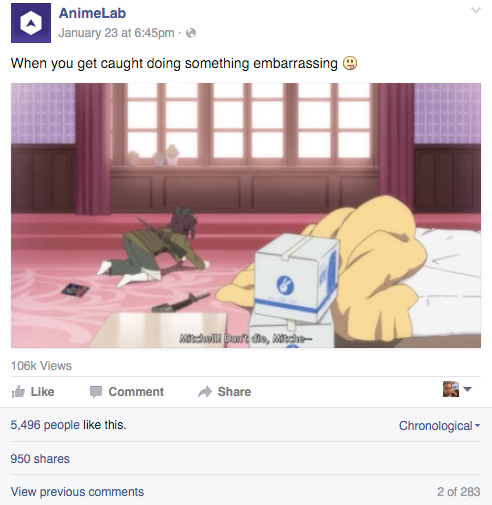 “Anime. Anytime. Anywhere” can give you the idea of the current brand positioning. As a matter of fact, they are in the middle of a transition period of launching “Funimation | Now”, a full-fledged anime-streaming service. Similar to Google’s algorithm, the primary goal of Facebook is to determine the quality of a post and will show it to users that it sees fit. Unfortunately, depending on the quality of posts, likes, comments & shares, Facebook will limit the number of organic views that are shown. In other words, even if you have millions of fans on your Facebook page but keep providing content that doesn’t get shared or commented on, then you get few views. So now that we have a better understanding of what they want, we want to tie this into our Facebook campaigns that allow for its current fanbase to get engaged with and share content. Thus improving the algorithm and thus, improving user engagement that will expedite the learning curve of new customers while convincing them it’s worth the value. 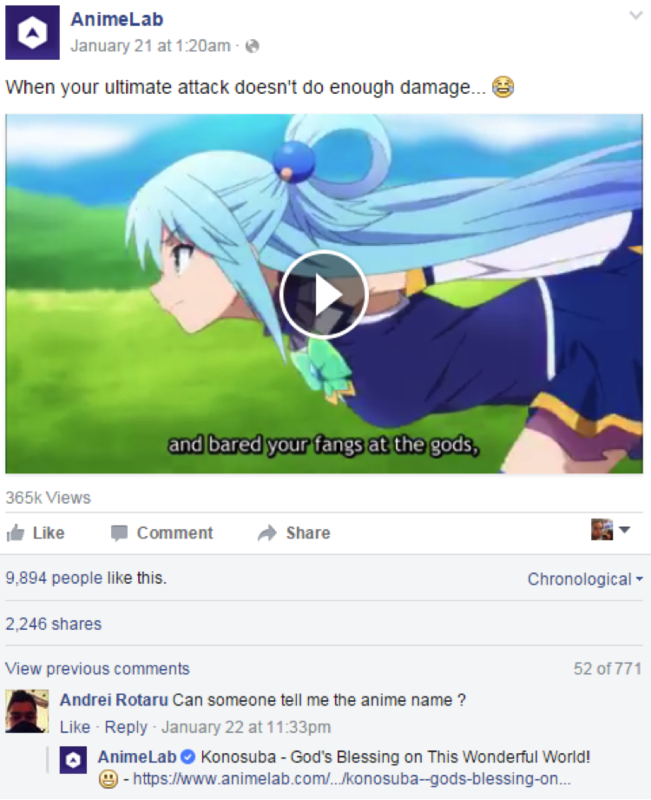 1.7 Million fans, only 1.5K views, and 1 share. Basic math says 1.5K / 1.7M = Atrocious.The video is 10+ minutes long. This is not natural to a Facebook user who is browsing on mobile or even on a desktop. The post content is ambiguous, are they asking fans to answer or is this a question that is talked about on their video? 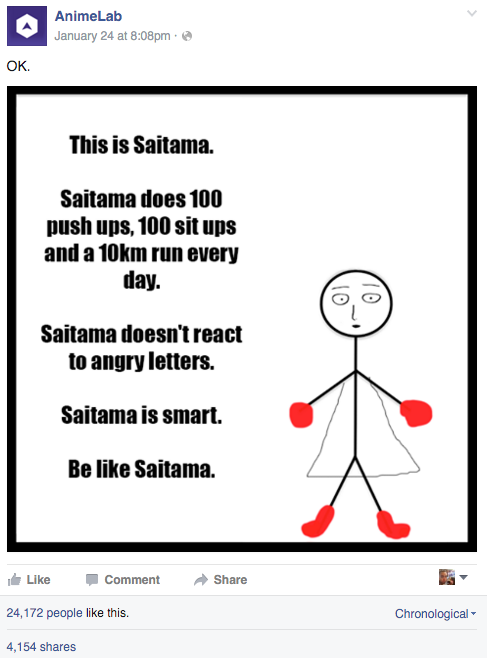 I’m very confused as to the point of this post. Solution: Stop hurting yourself and keep broadcasting your show on Twitch and upload your content to Youtube & and website blog. It would help draw in more organic visitors that are targeted to the correct medium. However, all of this is meaningless if they are unable to connect with their existing fanbase to take advantage of Facebook’s algorithm. 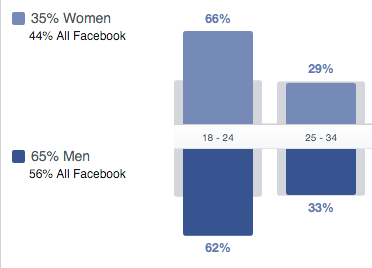 All of the above makes the FB Algorithm more likely to show future posts to their audience. Note that links are mentioned in the comments section. Users browsing on the phone or on a desktop will be more likely to click the link in the comment section since it would either be requested or less intrusive. It also feels more natural and has a “word of mouth” element to it. 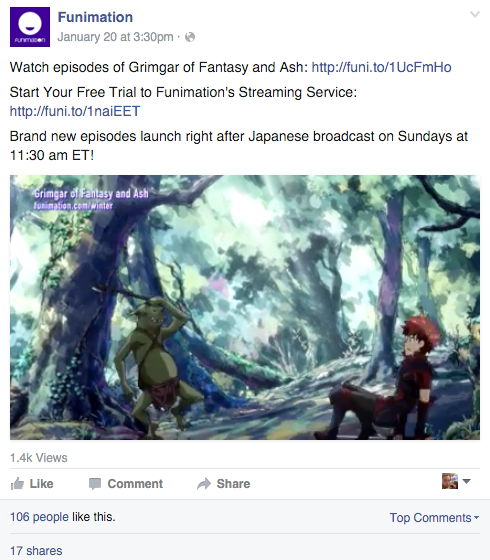 Adding Messenger for Business and focusing additional efforts on Funimation’s primary Facebook Page allows current customers and fans engaged with the brand. It will also allow for opportunities to convert fans into paying customers. Updated: September 24, 2017 – It’s been over 18+ months (Feb 2016) since I originally wrote this. As it stands today, here are the current numbers. Updated: September 10, 2018 – It’s been about a year since I last updated this article, let’s see how they both are doing to-date! Updated: April 4, 2019 – It’s been about a year since I last updated this article, let’s see how they both are doing to-date! 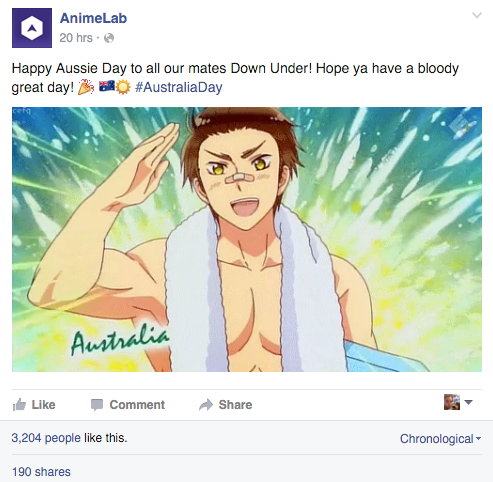 This post isn’t so much about Funimation dropping the ball but rather understanding how an up and coming company knew how to use social media to gain an incredibly loyal fan base with millions of followers in a relatively short amount of time.